Well, it's all getting very quiet down here folks. The number of terns at the colony has been decreasing dramatically over the past two weeks, with max. flock counts (adults + juveniles) dropping from 135 on 15th July to 105 on 20th and from 80 on Wednesday (27th) right down to c.60 birds this morning. The strange thing is that we don't really see any of the terns actually leave (i.e. a group heading off to the south) but it's certainly noticeable in the differences in flock counts from day to day. Amazingly, there's still one active nest left, K119 which has 2 eggs...and it's due to hatch any day now! I would have thought that this pair would have given up by now & abandoned the nest but they've stuck with it. Fair play! But then again even if the eggs do hatch in the next day or so the chicks won't fledge until late August, so they'll definitely be the last birds on the beach. The breeding figures for the season still stand at 99 pairs but now with 157 young, of which 117 are fully fledged juveniles & 40 are unfledged chicks (the majority of which will be on the wing in the next 10 days). It's great to be able to look down the foreshore & see groups of fledglings lined up, preening themselves whilst they wait (im)patiently for their parents to arrive with the next fishy meal. There's also quite a few young terns giving fishing for themselves a go too. Some seem to be just getting wet for the sake of it, as all they manage is a quick splash whilst others are more adept, picking up sticks, dropping them into the water & then retrieving them which must be an attempt at honing their accuracy. Although entertaining as it is to watch, the benefit of this kind of 'playing' will really become the difference between life & death later this autumn when juvenile terns have to begin fending for themselves. 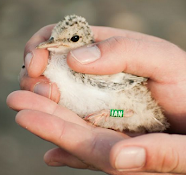 We've also been investigating some aspects of Little Tern feeding ecology this summer, with two of our volunteers, Ruby Stansfield & Rosie Newton, carrying out a short diet study of small (<1 week old) chicks. For the most part, sandeels prevail as the dominant food source but during the first few days, chicks are being fed heavily on gobies caught in the nearby lagoons & estuary. Older chicks & fledglings are certainly getting fed more specifically on clupeids, most likely sprat, which are often found discarded in the colony during nest checks. Still no trouble out of any of the local Foxes or Hedgehogs yet this season (touch wood) but the falcons are certainly making their presence felt. A male Kestrel swooped into the K-colony yesterday afternoon, grabbing an 8 day old chick which he promptly dropped as I ran straight for him across the beach! Save for a small puncture wound above the left leg, the chick was unharmed & ran off strongly down the foreshore after a thorough examination just to make sure it was ok...lucky divil! The last thing we need now in the final weeks of the project is for a Kestrel to start picking off our remaining chicks so Kestrel Watch 2011 has been initiated! A pair of Peregrines that bred in east Wicklow this season have produced two young, both of which can be seen flying up & down the coast most mornings, chasing everything in sight from Little Terns to Shags! In fairness, they seem to be just practising their hunting skills and more than likely wouldn't be capable of taking a tern but saying that I'll still be giving them the evil eye anytime they make an appearance!! !